Henry LAWRENCE (1586 – 1664) was Alex’s 12th Great Grandfather; one of 8,192 in this generation of the Shaw line. 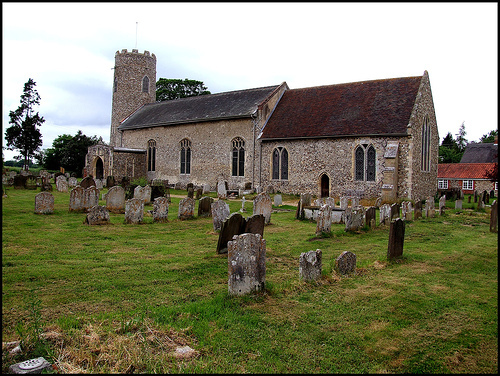 Henry Lawrence was baptized 10 Apr 1586 in Wissett, Suffolk, England. His parents were John LAWRENCE and Joan FRUSTENDEN. 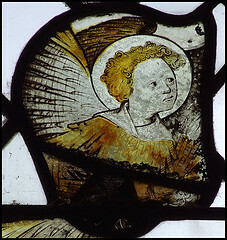 He married Mary WEST in 1608 in Wissett, Suffolk, England. He came to the American Colonies in 1630. Henry and his wife, Mary West were the first Lawrence’s to come over from England. 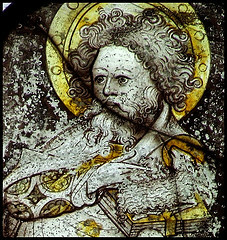 Henry died 2 Jun 1664 in Charlestown, Suffolk, Mass. Mary West was born in 1579 in Wisset, Suffolk, England. Mary died 3 May 1647 in Charlestown, Suffolk, Mass. Henry’s father’s will records that he had removed to New England. Henry is on the lists of those who became inhabitants of Charlestown, Mass in 1635. In the first division of land on the Mystick side, of ten acres to a house, five of which were given in for after-comers, as it appears 20 Feb 1638, Henry Lawrence received five acres. This entry was posted in 14th Generation, Historical Church, Immigrant - England, Line - Shaw, Pioneer and tagged Charlestown Pioneer, Malden. Bookmark the permalink. John Lawrence’s will was written about 1602 and he died in 1607, long before New England and Charlestown, were settled. Henry could not have been living in Charlestown at that time. Thus, there is no reason to say this Henry of Charlestown is a son of this John. It has also been proven that John Lawrence of Watertown/Groton was not a son of this Henry of Charlestown (see The Great Migration series at your local library). Sorry folks, you just lost all that nobility. This still does not discount a connection of some sort, so to say that we lost all that nobility is not true. 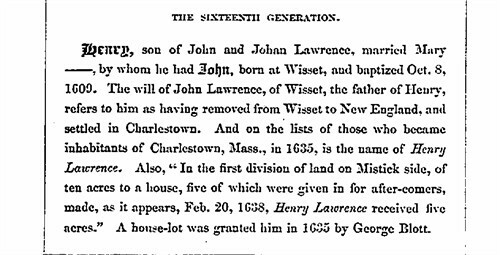 Lawrence, although not directly connected to John Lawrence of Watertown and Groton through Henry, does not make it a name that has no nobility associated with it. One generation in the mists of time connects our Lawrence with the same line, but we just don’t know which one it is.